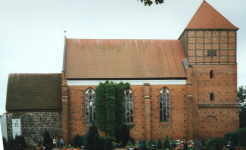 The church of Mestlin belongs to the most beautiful churches in Mecklenburg. It was built in the middle of the 13th century. Its three components: chancel, nave and tower, document the times in which they were each built, or remodelled. On the inside there are the altar, the pulpit, graveplates, bells, ..., which are an inexhaustible source for historians, for the interested visitor it is a small document of the history of Mestlin, or even of the history of Mecklenburg. The church of Mestlin (left: southern view) has been described in detail in the yearbooks of the "Verein für meklenburgische Geschichte und Alterthumskunde", Friedrich Lisch, Schwerin 1856 and in the book "Die Kunst- und Geschichts-Denkmäler des Grossherzogthums Mecklenburg-Schwerin IV. Band", Friedrich Schlie, Schwerin 1901. Even more detailed is the "Chronik des Mestliner Pastors Buchholz" from 1784/85. An up-to-date short description of the church has been written by Gerhard Voß. The following facts have mostly been taken from these works. The church consists of the chancel, the nave and the tower. The roman chancel (see picture on the right) has a quadratic basic form, the wall of the altar is even and made up of field stones (granite ashlars); the base and the corners have been hewed. The narrow window-openings (two on the southern side, three on the eastern side - Trinity Group) have slanting even loafings. The eastern gable, which is made of brick, is especially beautiful. There are five round arch blends with fine small columns and small capitals above a German ribbon. Above another German ribbon in a blend, there is a cross made of round sticks. The eastern gable of the church of Mestlin is one of the most beautiful ones among the decorated eastern gables of many churches. 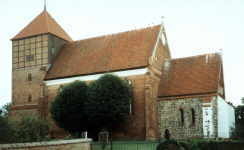 The first church, of which only the choir remained, has been built in 1250. The year 1750 on the weather vane implicates roof repairs. A new nave in the gothic style was attached to the choir a few decades later (most likely around 1370). The nave is a high, beautiful building in the pointed arch style, it has three-parted pointed arch windows (easy to make out in the picture on the left, northern view). The side walls are being supported from the outside by four strong, high pillars, between which there are three high windows. In the middle of the building, on the southern side, there is a rather big door, a smaller one, on the southern side as well, leads directly into the chancel. A third door can be found on the tower side. In the middle of the nave are two slim pillars, which carry beautiful pointed arch vaults (vaults: see picture on the right, easy to make out are the diagonal rips, which start shortly below the vault) Thereby the church gets divided into two naves (male and female side). The pillars, which have bases, are octagonal and positioned in such a way that four corners stand below the vault seperations and are dressed with services; so there's four services running up the pillars into four areas of the world. The vault rips are colored in black, grey and white and have a very peculiar decoration - they are covered with a number of discs or rip shields. Those discs are 30 cm in diameter and about 3 cm thick and are made of burnt light yellow clay and decorated with several reliefs like stars, crosses, and roses, which are always painted in various colors. The southern door (picture on the left) is framed by six bulges and alternately there are black, green and red brickstones. The tower was probably only built massive up to the height of the choir at the time of the extension, the rest of the tower was made up of wood. There is a gate that leads into it, which is made up of light green glazed and red bricks. If one can believe a date stone on the southern side there were further works done on the tower in 1749: it was slightly rejuvenated and two floors were added, above which there is the half-timbered carillon and finishing it off there's a tetrahedron roof. The staircase of the tower is partly made of stone and partly of wood. The wooden part goes 13 meters up and then leads into the stony one. In the tower are two bells - they came here in 1989 from Ruest (one bell from Mestlin went to Hohen Pritz). The bigger one from 1389 carries the inscription: Anno . Dni: MCCC LXXXIX . in veneoe . bti . stefani prothomris . teporbs . ioWitz . recors . in Mostelin. Buchholz interprets that in the following way: Anno Domini MCCCLXXXIX. In majorem venerationem beati Stephani protomartyris, temporibus Jowitz, rectoris in Mestlin. The other bell from 1525 is decorated with pictures of St. Augustinus and St. Nicolaus. It has the following inscription: nobilis oer * crc * tibi * psallo * pater augustino * ad * laudem * crisi * sepulchro * quo racuisti * an * m * v * uni und Hendrick van campen. The tower of Mestlin used to have to other bells: a bigger one (1683) carried the following names in its inscription: Klosterhauptmann Christoph Friderich von Jasmundt, Küchenmeister Ahrend Kalson, Pastor Johannes Simonis, Kirchenjuraten Joachim Kurdes und Johann Soltwedel, Gießer Vites Siebenbaum aus Schwerin - the bell has been melted down at the end of the last war. A smaller one (1776 melted and altered, before that the bell was without inscription) had the following names inscribed: Klosterhauptmann H. F. C. von Krakevitz, Küchenmeister C. F. Friese, Pastors Johann Clamor Buchholz, Kirchenjuraten Joachim Christoph Sommer und Johann Soltwedel, Gießer J. V. Schultz aus Rostock. The impressive triumph cross group (picture on the left, around 1500) is left from the medieval decor (see picture on the right, 1901). The crucifix in the middle and at the end of the cross arms are carvings of extraordinary quality. More witnesses of time followed later. First of all there's the oak chancel (picture on the right) with the figures of the four evangelists from 1689. It has the following inscription: H. Hanß Jacob Brandt, verwalter allhie, und seine Frau Armgart Dorothea Schnepels haben diese Kantzel Gott zu Ehren u. dieser Kirche zum Zieraht neu erbauen u. auß stavieren lassen. AO 1689 (Jacob Brandt, administrator, and his wife Armgart Dorothea Schnepels have commissioned s.o. to do the remodelling and decorating of this chancel to honor God and to embellish the appearance of the church. AO 1689). In the choir and immediately in front of it in the nave there are several grave stones, which originally didn't lie there, but partly have been taken there only in 1859 during the restauration of the church ( Simonis and Zanderin, Petri and Simonis, Frahm and Weber, Hausbrandt and Luneburg, Brandt geb. Schnepel). Worth mentioning are also the commemorative plaques with the names of fallen or missed citizens of Mestlin from the wars 1808 - 1815 (Quak), 1871 (Kröger) und 1914 - 1918 (picture on the right: Schult, Ehlers, Rambow, Renning, Meyer, Witt, Gads, Gads, Markwardt, Schröder, Rüter, Marquardt, Vorbeck, Frick, Wiese, Cords, Wendt, Ehlers, Arndt, Garling). The personal dates of the pastors have mostly been taken from "Willgeroth" without being marked as quotes. Around 1250 Building of the first church of Mestlin. Nicolaus, Herr zu Werle enfeoffed Dankqward von Gutzstevel with the manor Mestlin including the farms and villages belonging to it in 1354. J. Wytz used to be the church ruler in Mestlin. Around 1389 Building of the church of Ruest. One of the bells that are in Mestlin today, is being casted. It used to hang in Ruest from 1389 till 1989. It carries the inscription: Anno . Dni . MCCC LXXXIX . in veneoe . bti . stefani prothomris . teporbs . ioWitz . recors . in Mostelin. A. Altona used to be pastor and curate in Mestlin. P. Winckler used to be the church ruler in Mestlin. 1450 The church fief goes over to the monastry Dobbertin. A number of Gutzstevels sell their property to the monastry, substituted by the prior Nicolaus Beringer and the prioress Ermegard Oldenburg. Around 1500 the triumph cross group is built in the church. In 1525, the small bell from Mestlin had been casted (it came from Ruest in 1989). Its inscription: "nobilis oer * crc * tibi * psallo * pater augustine * ad * laudem * crisi * sepulchro * quo racuisti * an * m * v * uni " and "Hendrick van campen". 1541 Introduction of the reformation in the area of the monastry Dobbertin. 1557 Ruest is mentioned in the church visitation protocol as a subsidiary church of Mestlin. Church visitations are being realized during and after the reformation by the new church ruler, the country ruler. They mostly served the registration of all circumstances (property, ...) of all churches in the country. N. Georgius is mentioned in Schlie's book with the date 1569, Buchholz, however, doesn't mention him at all. Georgius is supposed to come from the Dittmarschs, he was registered at the university in Rostock in 1566. Lönnies (Leonisius), who was born in Parchim, has been registered at the university in Rostock in 1563. He is most likely the son of the pastor Caspar in St. Georgen in Parchim. Schnepel, who was born in Sternberg, has been registered at the university in Rostock in 1579. He was married with Ursula Nienkercken, mayor's daughter from Goldberg. Through his daughter Ursula he became the progenitor of the preacher families in Mestlin from 1617 till 1829. Duncker, son of the pastor in St. Petri in Rostock, became pastor on July 17th, 1616, but died shortly after the inauguration. From 1615 till 1617 there is no pastor in Mestlin. Simonis was born in Malchow as the son of the cobbler Hans Simon. He was registered in Helmstedt in 1611. He had been pastor in Mestlin since June 22nd, 1617 and married the daughter Ursula of the deceased pastor Andreas Schnepel. In the "Beyer" (Landpastor) is written: Simonis was supposed to marry Schnepel's oldest daughter Elisabeth, and give something to the widow. But he took the youngest, and didn't want to obligate himself to great tributes, but give freely. This had not been taken up well by the mother-in-law, she didn't give a single chick or sheep and took everything out of the house. The marriage had to be paid by Simonis, and the bride had to dress in a black-greenish skirt and a small cloak. Their descendants, the preacher's families Simonis, were in bloom in Mecklenburg until the beginning of this century. 1638 - 1645 Due to the events of the war there is no church service in Mestlin, no soil is being cultivated. Johann Simonis was born as the son of the deceased minister Bartholomäus Simonis on December 25th, 1622 in Mestlin. In 1644 he was choirmaster in Crivitz, on May 6th, 1645 he became pastor in Mestlin. In August 1688, he retired and died on February 14th, 1696. On August 26th, 1645, he married Sophie Zander (1625 - May 14th, 1700) (KB Lohmen), the daughter of the pastor Peter Z. from Dobbertin. Simonis improved the church in many ways and gave back what it had lost during the war (under heated arguments with the monastry office). The parsonage was probably destroyed when or shortly after he came into office, because Simonis lived in the curation-cottage in Ruest, because there is no parsonage in Mestlin. 1647 The documentation of births and baptizings in the church book begins, however, in the first years it is quite incomplete. 1649 A church visitation protocol describes the taxes raised by the minister of Mestlin and Ruest. 1650 The minister lives in Ruest, because there is no parsonage in Mestlin. 1654 The documentation of the copulations in the church books begins, but then it stops until 1663. 1660 The documentation of the deceased in the church book begins. 1662 A church visitation protocol describes the taxes raised by the minister of Mestlin and Ruest (in Mestlin there are 8 building people, 7 people that live in cottages (two in big ones, five in small ones), in Ruest there are four building people and 2 people that live in cottages). 1683 The big bell is being fastened in the church. Petri was born in Seehausen / Altmark as the son of the brewer Martin P.. After 1680, when he was choirmaster in Sternberg, and he "was a man of good science, fresh character and good morals, who led the youth very much to respect everyone", he became "thanks to his skill and good conduct" the pastor in Mestlin on August 24th, 1688. On September 4th, 1688 he married Margarete Simonis (* approx. 1661, + October 9th, 1722), daughter of his predecessor. 1689 Chancel and the office chair are being remodelled. Usually, the administrator sat on the office chair. 1691 Building of a new baptismal font in the church. 1693 The altar and the confessional box are being rebuilt (the old altarpiece now stands next to the organ at the western side of the church). 1694 The Agreement of Dobbertin is being made, it covers a number of points concerning the ecclesiastical posessions between the pastor of Mestlin and the monastry of Dobbertin. 1697 The church of Mestlin receives a church clock. August 22nd, 1704 Specification of the confession children by A. Petri. April 1705 The minister Andreas Petri dies. He wrote a Büchlein mit Pfarr Nachrichten (little book with ministral news) (source: Buchholz). 1708 In order to support the side walls of the chancel, one pillar per side is being put on the outside. 1709 The mayor Joachim Bremer build a special chair for himself in the church of Mestlin (Mayer Chair). 1709 Building of the nine church benches in front of the chancel by house owners of Mestlin in the church. The following seating order was common (see picture on the right: ground plan of the church - from left to right: tower, nave, chancel): half of the first bench remained empty (lower part in the picture, right), on the next bench there sat Dutchmen, court shepherds and their farmhands, on the remaining 7 benches sat the house owners and the people owning a cottage. On the bench behind the door sat the minister- and mayor farmhands, on the remaining three benches was room for all other farmhands, half- farmhands and boys. Behind these benches were five chairs that lied a little higher - these have been built in 1747 for the glass factory workers from Mühlenhof. On the benches in the other nave (upper part in the picture) sat the women. On the first one sat the wife of the pastor (and company), on the second the wife of the administrator (and company), on the third the wife of the forester and the wife of the mayor (with company). Carl Helmut Neander was born in Göhren / Strelitz as a son of the pastor Friedrich N., who came from Loitz in Western Pomerania. He has been pastor since August 29th, 1717 and has been inaugrigated on October 10th, 1717. Minister Carl Helmuth Neander marries the widow of the deceased pastor Georg Brennecke Anna Sophie Juliane Petri (+ July 28th, 1761). 1747 Five more benches are added in the church for the glass factory workers (from Mühlenhof). 1749 is the date in one of the brickstones at the tower of the church. The date 1750 on the weather vane on the tower probably indicates that the work on the tower has been finished in that year. In 1750 and in the following year the widow's house (see picture on the right), which is still standing, was being built. It had a hall, a kitchen, three heatable rooms, two cubbyholes, one pantry, and two cellars. 1752 - 1754 There is no minister in Mestlin. Minister Johann Clamor Buchholz was born in 1726 in Varchentin as the son of the minister Samuel Heinrich B.. On June 24th, 1754 he was inaugrigated as pastor in Mestlin, in September 1793 he retired. On August 2nd, 1754 he marries the daughter of the deceased minister Carl Helmuth Neander, Sophia Friederica. 1755 The documentation of confirmations in the church book begins. 1755 Building of a new parsonage in Mestlin, which is still standing today. It used to have eight living rooms, one room, one kitchen, a pantry, a back hall and a cellar downstairs, and upstairs were two attics with four gable rooms, six small rooms, and a smoky chamber. Further buildings are a barn, a cattle house, a pigpen, a washing house, and a garden cellar. In order to support the east wall of the chancel, two pillars are being put on the outside of it. Furthermore the roof of the chancel is being replaced by a completely new one in 1770/71. 1776 Fastening of the melted and altered small bell in the church. Before that, the bell did not use to have a date or an inscription. It has been removed recently. 1784 / 1785 Minister Johann Clamor Buchholz writes the "Buchholz Chronik" (Buchholz Chronicle): Detailed news from church- and ministral affairs in Mestlin and Ruest. 1793 Minister Johann Clamor Buchholz is being retired. He dies in 1794. Schulz is being born as a citizen's son in Egeln in Halberstadt. He has been pastor from September 1st, 1793 until his retirement in March 1816. On September 20th, 1793 he marries the daughter of the deceased minister Johann Clamor Buchholz, Katharina Elisabeth (* May 1st, 1764 - + August 19th, 1798) and after her death (before 1800) Caroline Friederike Mühlenbruch, daughter of the office writer of Dobbertin, the later lease-holders in Mestlin and Kl. Poserin Johann Gregor Mühlenbruch (approx. 1777 - September 11th, 1816). Heydemann was born in Lexow near Malchow as the son of the sexton Hans H.. On March 3rd, 1816, he became the pastor in Mestlin. On May 10th, 1816, he marries the daughter of his predecesssor Friederike Luise Sophie Schulz (June 5th, 1795 - June 28th, 1826) and after her death he marries her sister Johanna (January 3rd, 1800 - November 12th, 1848) on November 15th, 1827. Birkenstädt was born in Granzin near Lübz as the son of the pastor Christian Heinrich B.. He had been pastor in Mestlin since October 24th, 1830, he was inaugrigated on November 28th, 1830. On July 18th, 1831, he married Mathilde Wilh. Friedr. Helene Spangenberg (approx. 1809 - December 25th, 1885), the daughter of the advocate at the court yard Dr. Joh. Friedrich S..
1855 Building of the organ. It stands on a chancel at the western side of the church. 1859 Restauration of the church, a few grave plates are being taken over into the nave. 1859 Altarpiece by G. Lenthe: Christ on the cross. The picture shows Christ on the cross. At the bottom part of the cross stand (or knee) the mother of the lord and Johannes and Maria. H. was born in Fürth in the Odenwald in Hesse as the son of the future district court actuar of Darmstadt, Abraham H.. On December 6th, 1868 he became the pastor in Dreilützow, on September 10th, 1871 he became pastor in Mestlin, where he was inaugregated on December 10th, 1871. He assumed the office on January 2nd, 1872. On November 1st, 1895 he retired and died in Rostock. On June 11th, 1869 he married Anna Elisabeth Schwarz (January 1st, 1847 in Gießen - September 26th, 1917 in Gehlsheim), the daughter of the university's porter Carl Friedrich S., in Körchow. W. is a pastor's son from Alt Meteln. On October 27th, 1895 he became pastor and was inaugregated on November 17th. On November 16th, 1918, he became pastor in Ankershagen. W. was born in Rehna as the son of the future pastor in Kladrum Wilhelm W.. Since October 6th, 1918 he was the pastor in Mestlin, assumption of office on December 15th. On September 27th, 1907 he married Agnes Carol. Sophie Stammer (January 18th, 1881 in Sandesnebern - ? ), the daughter of the future pastor of Mustin in Lauenburg Hans S.
From 1974 - 1983 there is no pastor in Mestlin. In 1989 both of the bells from Ruest are being brought to Mestlin. On the graveyard of the neighboring village Ruest (the church of Ruest is a subsidiary church of the one in Mestlin) there are luckily a number of old graves and gravestones, since it hasn't been tended very well. ... Sophia M. F. Hahn geb Wendt *3.3.1815 +??? It is to wish that the old graves on the graveyard in Ruest could be preserved. There is also a memorial stone with a plaque on the graveyard in Ruest that reminds us of the victims of World War I:Egger, Braasch, Bartels, Jarchow, Milding, Cords, Egger, Jarchow, Dieckmann, Dau, Haefke. After the opening of the wall the life of the municipality was activated. First of all, we have to mention the remodelling of the church. What had been left to wind and weather for years, is now shining bright new again. The calender of events is filled again as well: Christian theory, confirmation classes, women's circle, senior citizen afternoons are regular events. 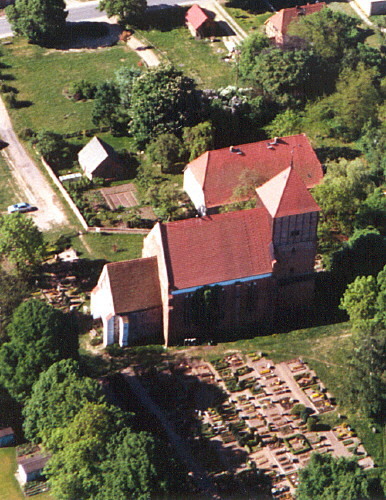 But there's also highlights like Golden confirmation, children's Bible day, municipality trips, and cultural events in the church like for example the show of the Donkosaken choir in June 1999.
picture left: birds eye view of the church (click on the picture for a larger scale).